Have you lost some or all of your teeth? Then you might be a good candidate for dental implants. This revolutionary restorative dental treatment is the perfect solution to fix those problems. At The Glenroy Dental Group we provide single tooth and multiple teeth replacements with implants. 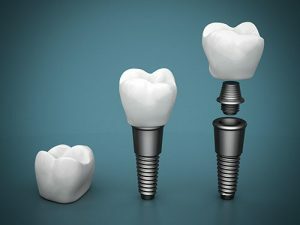 We will assess and plan your implant needs. Our team is extensively trained and experienced so you can be assured that you can fully enjoy the benefits of your new smile with our dental implants. Strategically placed implants – used to secure dentures on the lower arch, upper arch or both. An ideal candidate for implant surgery must have good overall dental and general health. Moreover, you must have sufficiently dense bone tissue in the jaw and be free from gum disease. If you smoke, you should be willing to give up the habit especially when the treatment starts and during the Osseointegration period. You should also try to commit to healthy habits, follow a good dental care regimen and have routine dental visits following the surgery. Your dentist will evaluate your case to see if you are a suitable candidate for implants. Your medical history will also be checked. Your teeth and gums will be carefully inspected before commencing any procedure. Your dentist will plan the tooth restoration in consultation with you. The dentist will perform the procedure and insert the implants into your jawbone. After the surgery, it will take around 2 to 6 months for the implant to fuse to the bone – a process called Osseointegration. The treatment will be completed by installing a dental crown or tooth restoration onto your dental implant.